Every so often my friend Maggie will let me create something for her beautiful website, Eat Boutique, and it always completely freaks me out. Have you ever visited? Every lovely individual who posts over there is incredibly amazing at styling and taking food photos and I’m so not even remotely in their same league, but I try really hard when I’m scheduled to bake and create. 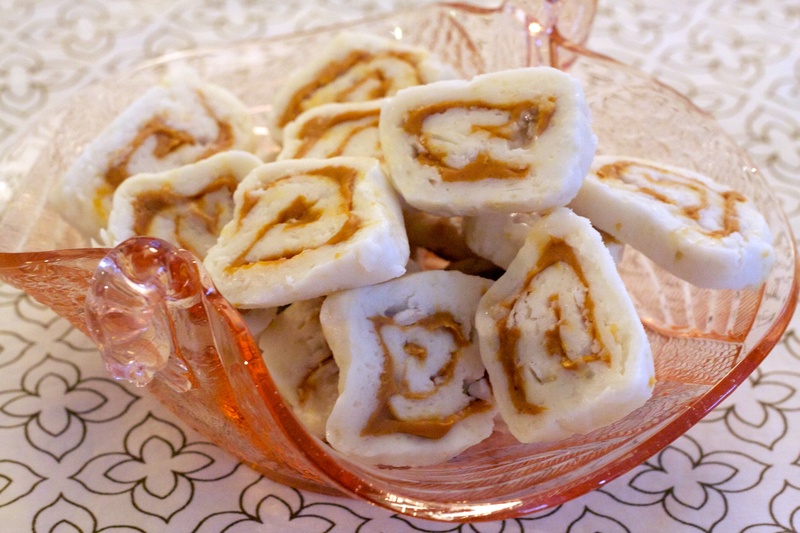 Most recently I was asked to take a look at The Liddabit Sweets Candy Cookbook. It’s seriously adorable and would make a great holiday gift. You can check out my thoughts on it as well as enter to win a copy of your own right over here. I ended up making Tropical Toffee from the cookbook for Eat Boutique and it is crazy addictive and a total home run, but the first recipe I made…well…I kind of screwed it up. Which makes me laugh because it’s probably the easiest recipe in the book. 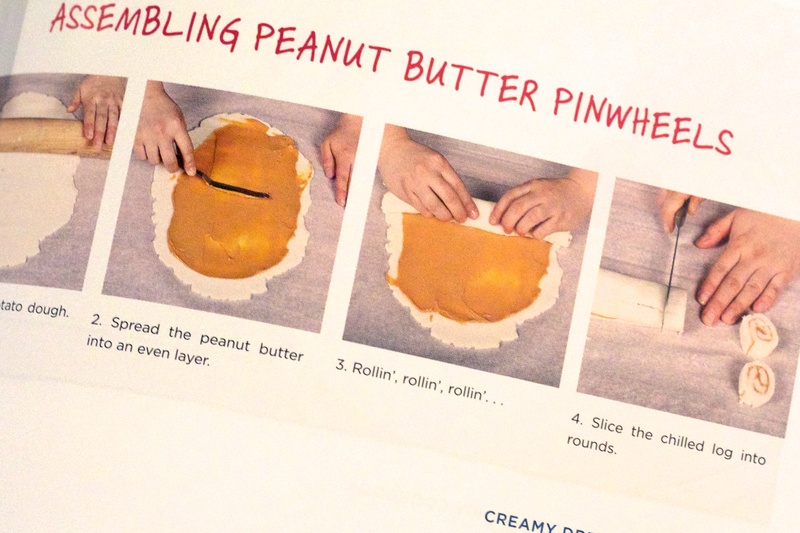 As soon as I happened upon the Peanut Butter Pinwheels page I knew that was what I wanted to make. I’m a huge caramel creams fan and I thought these looked similar only sort of inside out and stuffed with peanut butter. Yum! So I dutifully baked a potato. Yes, this candy, much like needhams, contains a big mashed up starchy potato. Then I slowly added confectioners’ sugar and more confectioners’ sugar and more, and more, and more. Then I was getting really close to running out of sugar which I needed to roll out the candy. Unfortunately, the day I was home making the pinwheels CK had the car and I couldn’t get to the store. So I made a decision to stop mixing and just chill the dough even though I knew it wasn’t quite stuff enough. Then I rolled out the candy a little too thick and finally I ended up with these crazy looking homemade oblongs that tasted like Candy Land exploded in your mouth but looked like they were made by a six-year-old. So if you do make this recipe, and you should (please don’t let my images dissuade you) make sure you have enough confectioners’ sugar on hand and maybe another person to help you mix the dough because your hand is going to truly feel like it will fall off. PS: Want to really know how sad I am at styling photos? While the candy dish is quite pretty (thank you for the new pink Depression Glass piece, Gram!) The background fabric in this picture is my pillowcase. A ha ha ha … yeah you’re never going to read here again, are you? Make me feel better. What weird props have you used in photographs on your blog? 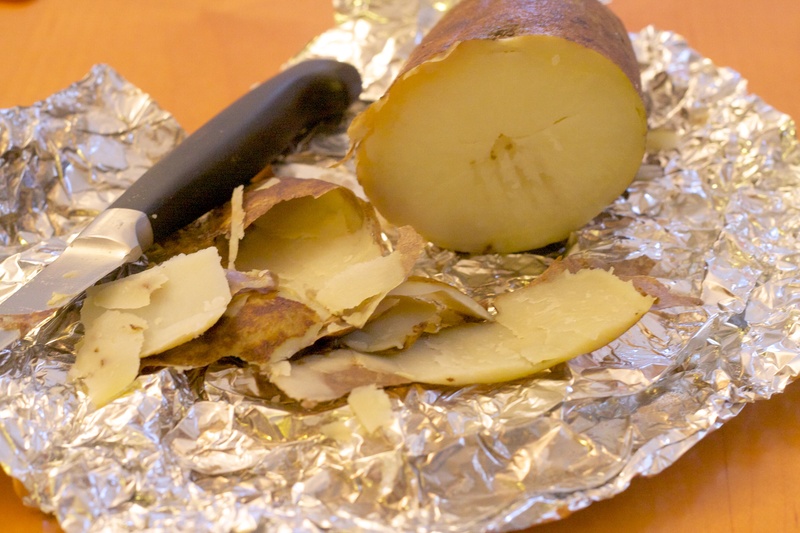 In a medium-size bowl, gently mash the baked potato with a fork, just enough so that there aren’t any big lumps. Add the butter, 4 cups of the confectioners’ sugar, and the vanilla, and mix well with a rubber spatula until smooth. The dough should be very stiff and sticky, almost like Play-Doh. If it’s too thick, add a little cold milk; if it’s too thin, keep adding confectioners’ sugar, 1/4 cup at a time, until it reaches the correct consistency. Add the coconut, if you’re using it, and mix to combine. Divide the potato dough in half and form it into 2 balls. Wrap each one tightly in plastic wrap, and allow them to rest in the refrigerator for 1 hour. Remove the balls of dough from the refrigerator. Generously and evenly sprinkle confectioners’ sugar over the surface of the prepared cutting board. Roll out one ball of the dough into a rough 12-inch circle that’s about 1/2-inch thick. Use the spatula to spread half of the peanut butter evenly over the surface. Sprinkle 1/2 teaspoon of the sea salt evenly over the peanut butter, and starting at the edge closest to you, carefully roll up the dough into a log shape. Wrap the log in a piece of plastic wrap, or parchment or wax paper secured by twisting the ends together (this will help the log hold its shape). Chill in the refrigerator for 30 minutes. Meanwhile, assemble the second log. Once the first log is firm enough to cut, use a sharp chef’s knife to slice it into 1/2-inch-thick rounds. Wrap each piece in wax twisting paper. Repeat with the second log. Store the pinwheels, layered between parchment or wax paper, in an airtight container in the refrigerator for up to 4 weeks. I think the pillowcase looks terrific, actually! And the candy sounds intriguing, especially the potato part. I might have to get my hands on this book. Previous post: Let the Christmas Pinning Obsession Begin!